All handmade from raw materials. Beautiful ironwood and antler ring with crushed turquoise inlay. 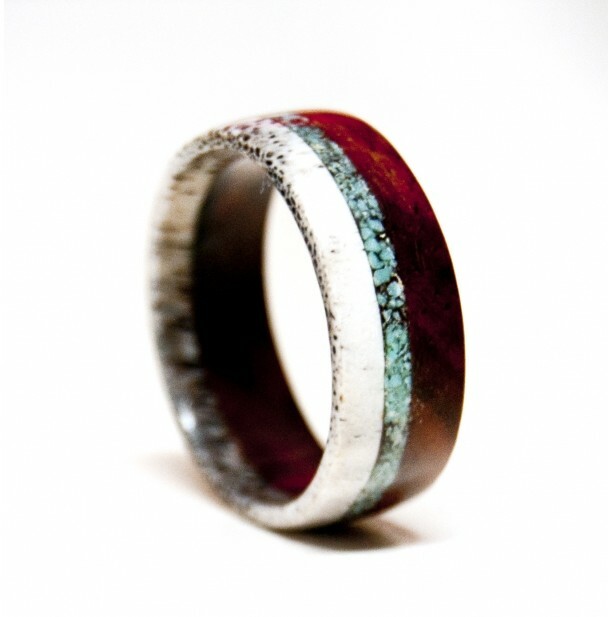 Would make an exceptional and unique wedding band or even statement ring. Ironwood is a desert wood that is incredibly hard and dense. All rings are made to order. Sizes available are 2-15. Half sizes available as well. *****NOW OFFERING THIS RING WITH A TITANIUM LINING*********** Interested in this ring but want more durability and strength but still maintaining an organic and unique look? We now offer this style with a titanium lining for an additional fee. FREE SHIPPING ON US ORDERS! Comes shipped in a unique wood box. Each ring can be sealed with either beeswax for a natural matte finish or a glossy hardening finish for more protection.